Whether you’re converting a loft or building a new one-and-a-half storey home, a dormer window could be the best way to bring extra headroom and daylight into the upper level of your property. Dormers come in all shapes and sizes, but they’re notoriously difficult to get right in terms of how they blend in with the rest of the dwelling. There’s a fine line between gaining as much space as possible inside and making sure it looks in proportion with the other external features. Get your dormer window right and you’ll have a practical, attractive feature; get it wrong and it’ll be an eyesore that ruins your property’s kerb appeal. Architect Kieran Gaffney advises creating a model out of card so you can see the project in 3D. “We often do this to visualise the overall design; you’ll quickly see if the balance is right,” he says. 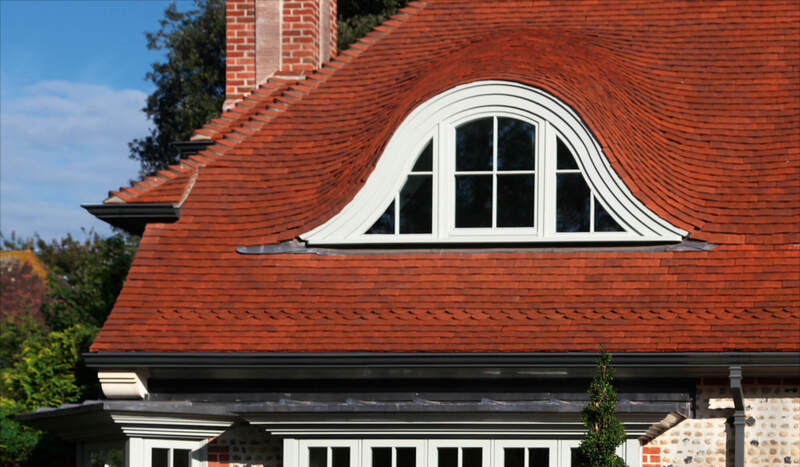 The key thing to remember is that bigger does not necessarily mean better – read Kieran’s advice on how to design the perfect dormer in the expert tips section below. What type of dormer window should I use? Deciding what style of dormer is right for your project will largely depend on the outside appearance of your home. The trick is to be consistent, both with shape and materials – for instance, if you’ve got gable ends on your property then go with a gable dormer. Another thing to note is the pitch of the main roof – flat-topped dormers tend to work best on shallow coverings because they don’t need as much height as some other designs, for example. While dormer windows at the front of the house will need formal planning permission, rear additions normally fall under permitted development (PD) rights. But remember that rules change depending on where you live, so it’s always advisable to seek guidance from your local authority. There are also regulations about how much space can be added inside the house – 40m3 for terrace properties and 50m3 for a semi or detached house. Most dormers will fit into these brackets, but you may need to re-think if you’re planning to add a full-width style. How can I decide what size dormer is right for my house? These windows jut out of the roof shape to create more headroom, but the bigger they get, the uglier they tend to look – the trick is to make sure they do the job while looking aesthetically pleasing outside. Details like this need some expert input, so work with an architect to get it right. Try to keep dormers small and thin and be consistent with style – stick to a sleek appearance if the house is contemporary and use proper traditional details to remain in keeping with a period look. It’s best to avoid using too many materials, so keep it simple. How much headroom can a dormer window bring to a loft conversion? Often more than you think. Modern box dormers can add lots of room and look wonderful inside, but can sometimes look out of place externally. The size required really depends on the height of the roof. If you’re converting a loft that has a very low ceiling then you’ll need a bigger dormer, but go smaller if you have a deep pitch and can stand up easily inside. Be aware that traditionally built roofs are often self-supporting, so you may need to bring in additional structural support (usually a ridge beam). Your structural engineer and architect will be able to offer advice on what’s needed. Is Triple Glazing Worth the Money? It is possible to bring a contemporary twist to a dormer window? Quirky designs can work, but it depends on the roof shape and space needed inside. Consider extending the glass around the edges into the haffitt (the triangular sides) for more views out and daylight in. Sometimes it works to break the rules by putting a modern-looking style into a period property – we did this on the house pictured below left – but it’s harder to get this right. When might a dormer window be more suitable than adding another full floor on a new build? While a complete storey is often preferable, there may be reasons why you’re limited. You could face planning restrictions on how tall your house can be, for instance. Some planners also have limitations on how big the dormer can be, so it’s always worth talking to your local authority prior to submitting an application for something like this. The positive thing about putting a dormer window into a new property is that it’s easier to make it feel well-integrated into the design than if you’re retrofitting. What rules and regulations are there for dormer windows? While you can use almost any window, remember that it’s more exposed to the elements because it’s positioned high. Think about protection against driving rain; setting the structure slightly back from the building edge or incorporating an overhang are good solutions. You’ll also need to make sure it’s safe – there are guidelines to ensure nobody can fall out of high windows, so you might need a barrier of some sort. Also, you’ll probably need to prove that the glass can be cleaned without someone leaning out and risking their safety. That could mean having the unit opening inwards or demonstrating there’s a safe way of cleaning it.